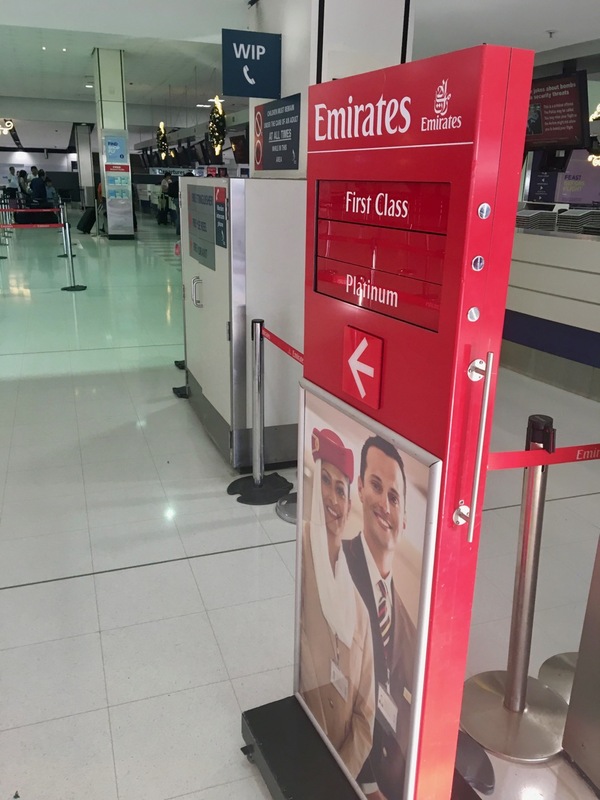 With Qantas’ partnership with Emirates, an ongoing and useful provider of benefits to points-collectors, redeemers and frequent flyers, Emirates First Class has become one of the most useful and unique ways to use your Qantas Points. 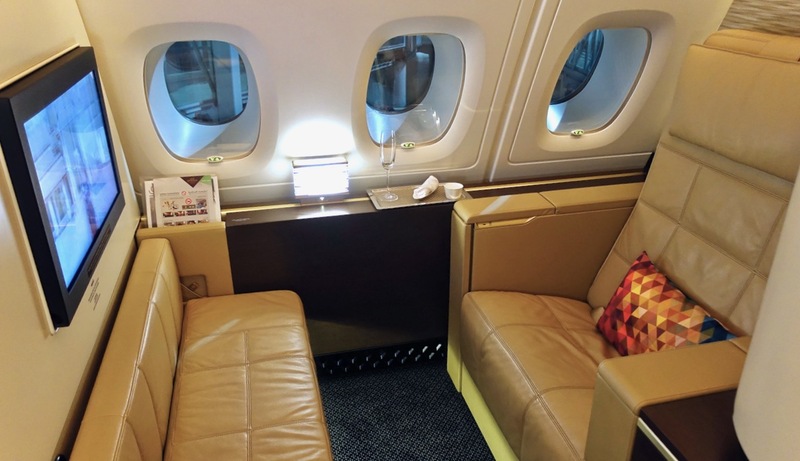 I’ve had the chance to sample Emirates top premium cabin a few times in the last year, so here is my take on how to get the most from your trip. 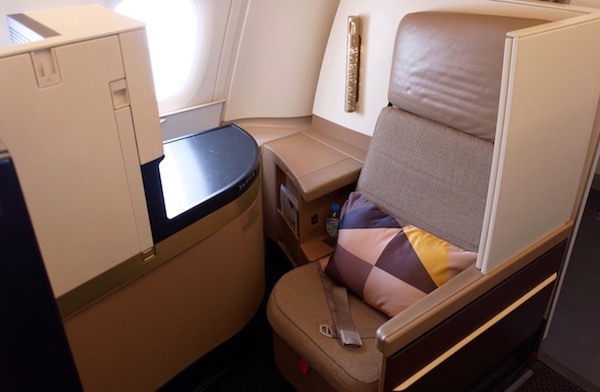 Later in this overview, we cover off the various ways to redeem your points to travel in Emirates First Class, with the key opportunity for Australian travellers being their Qantas Points balances. Emirates is by far the largest operator of Airbus A380 (as well as Boeing 777) aircraft in the world, with 104 in service and another 58 on order (as of September 2018). 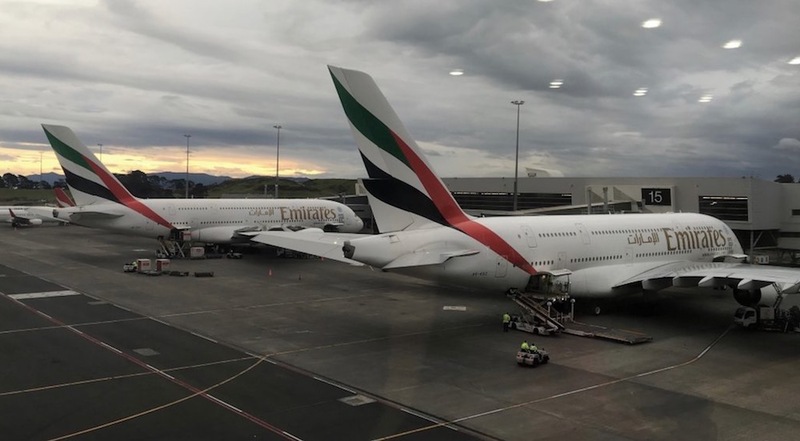 About 40% of all Emirates planes are A380s, so there is a good chance that you will be travelling on one of these if you are flying long-haul and/or to or from a major airport. You can check if your flight is on an A380 or different aircraft through Google Flights or SeatGuru. 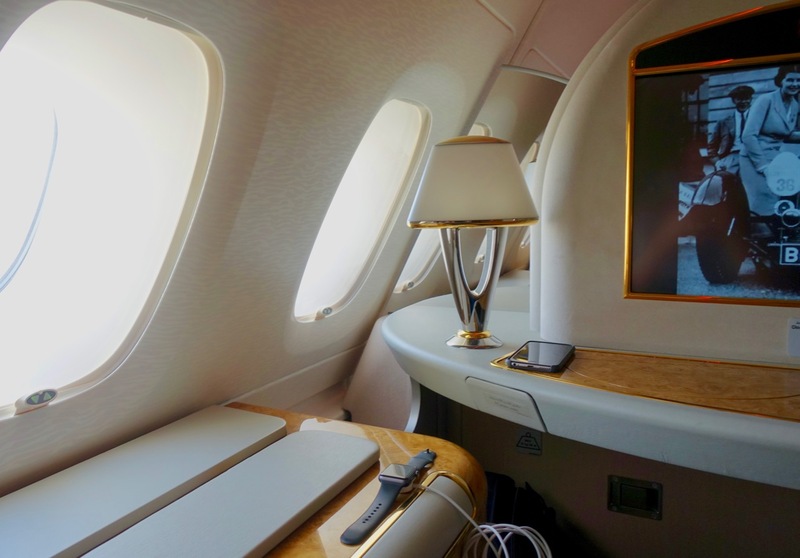 There are three versions of the A380: two have 14 First Class Suites and are the most common but on some routes, First Class is cut to make room for more Economy seats (557 to be exact!). 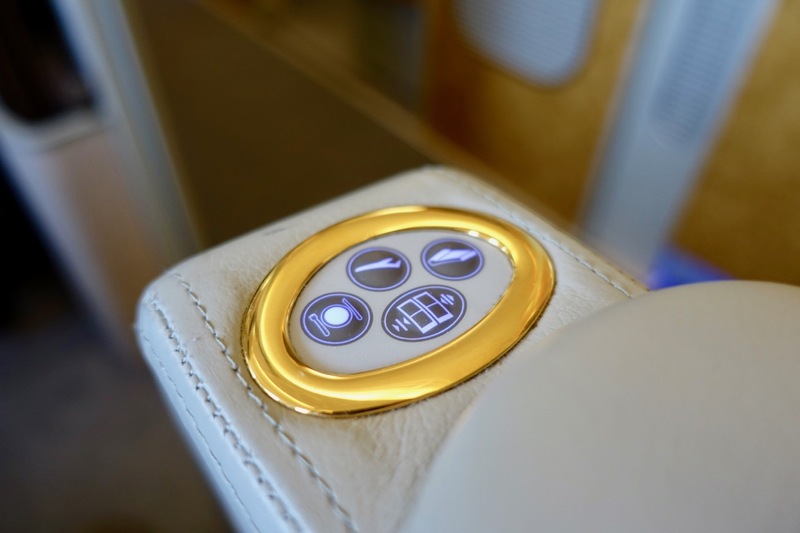 How do the First Class products on the A380 and 777 differ? 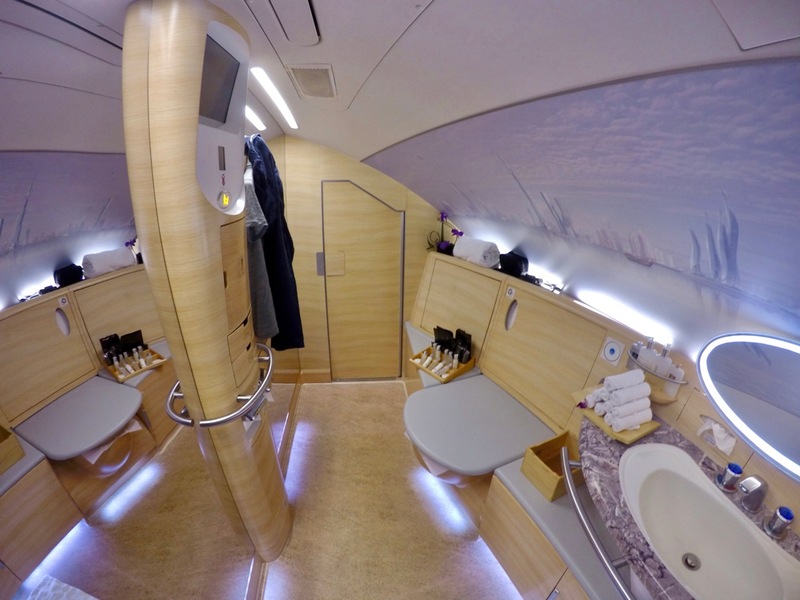 If you are flying on the A380, you’ll get to access the onboard shower and bar—explored later on—but with almost double the number of suites, service will probably be less attentive. 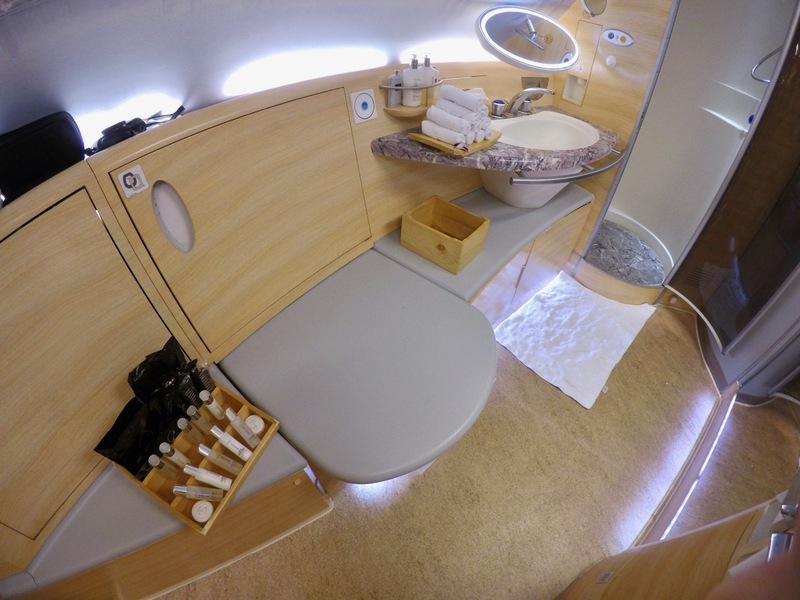 By contrast, having eight suites instead of 14 means that service on the 777 is generally more attentive. 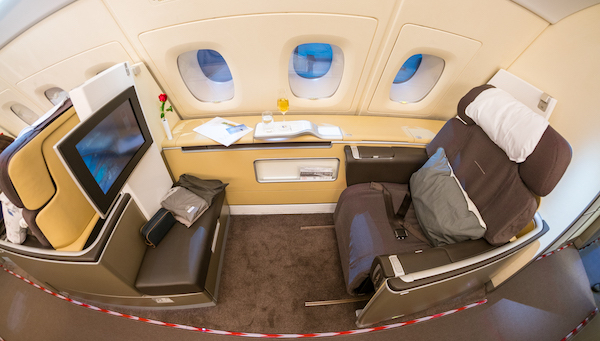 Also, each individual suite on the 777 is more spacious than on the A380 due to the wider cabin cross-section. 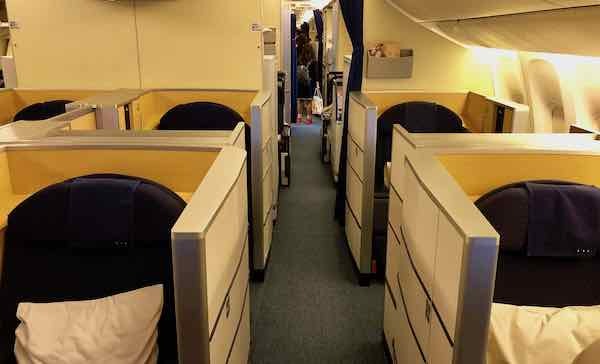 The smaller cabin feels more intimate. 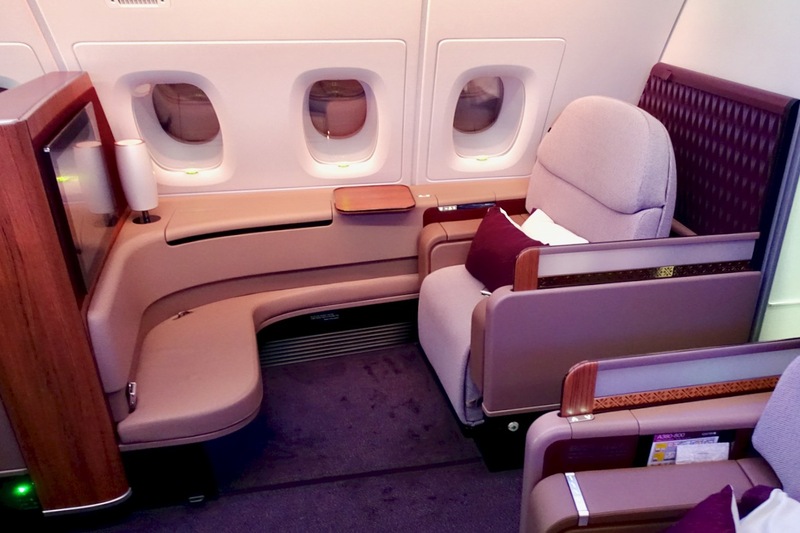 The First Class cabin is located on the upper deck at the front of the plane, with 14 closed suites in a 1-2-1 configuration and no overhead bins. 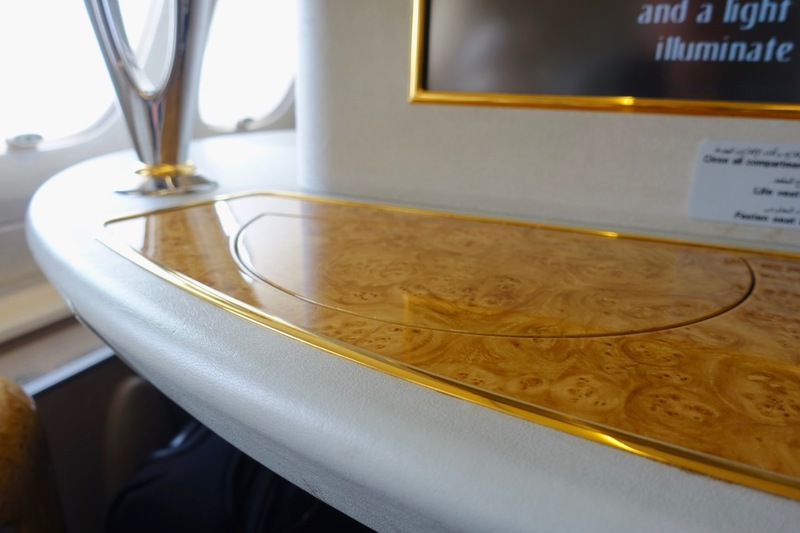 Emirates delivers on the promise of ‘bling’ in their First Cabin, trimmed in wood, gold accents and orchids at every seat. Each suite has closing doors and its own lighting surrounding your seat/bed. 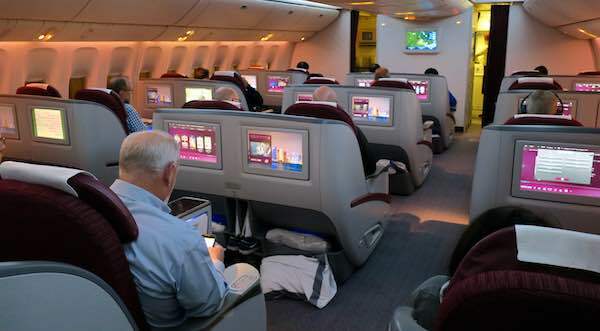 Passengers travelling with a companion may prefer the centre seats (1E and 1F, 2E and 2F, or 3E and 3F) with the retractable privacy divider, whilst solo travellers will probably want to opt for the window seats (A and K in any row). If you had the choice, I’d recommend avoiding rows 1 and 4 to cushion against noise and foot traffic from the two shower suites/bathrooms in front and one bathroom and galley behind. Get more first-hand seat and flight tips from Natasha’s case study. 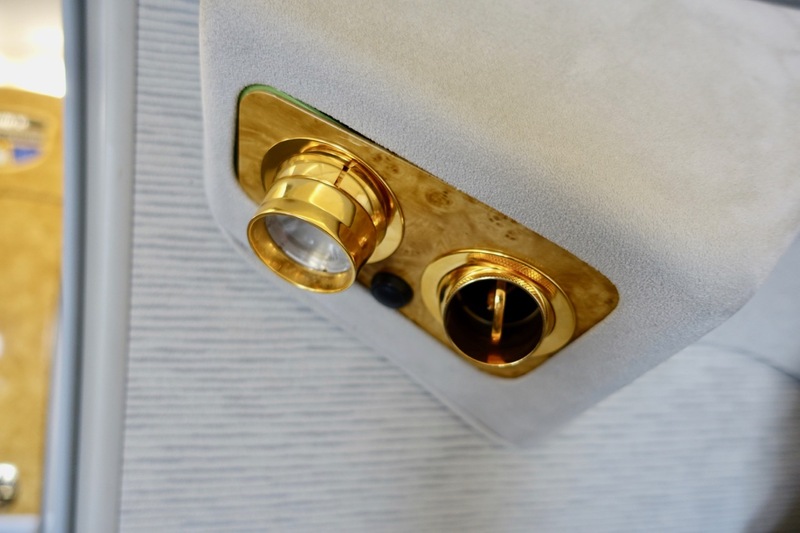 Each seat offers charging for your USB devices, copious amounts of storage for your belongings, and many ways to customise the lighting and seat recline for your own taste. 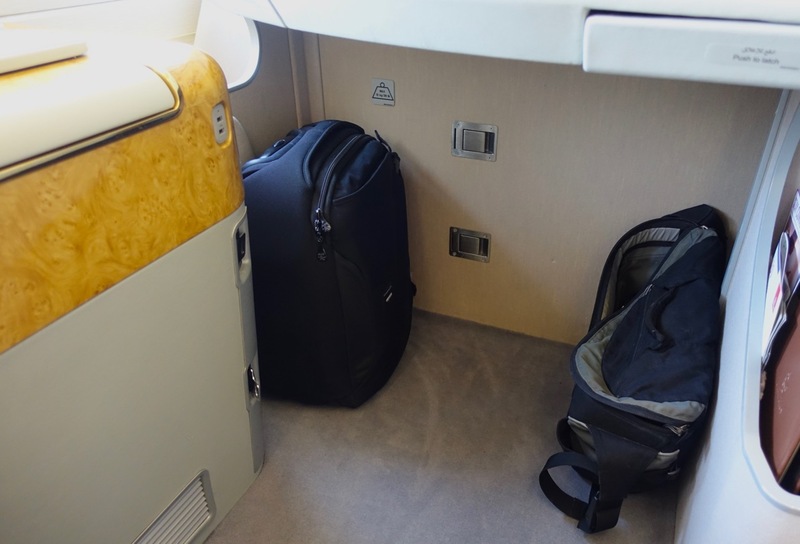 There are no overhead lockers in the cabin, which maximises headroom, so your carry-on luggage fits under the small bench seat/footrest in front of you. 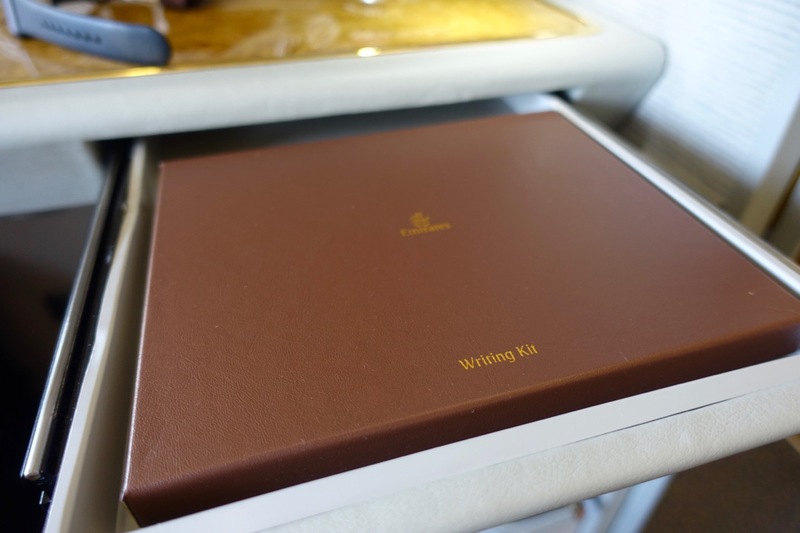 And just in case you need to channel your inner Hemingway in flight, there’s a dedicated writing kit in each seat. 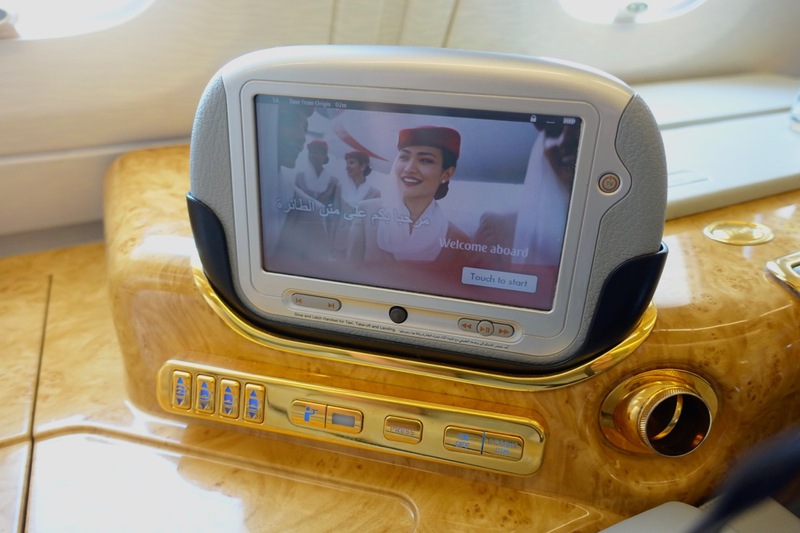 Emirates ICE inflight entertainment system is excellent, with the same content as you’ll find in all cabins on the A380 and the same seat-side controller as you’ll find in Business Class. The main difference to Business Class (and especially Economy) is the vast screen you get in First, which is so far away from your seat it’s almost impossible to reach. This is where the small touch screen controller next to your seat helps. 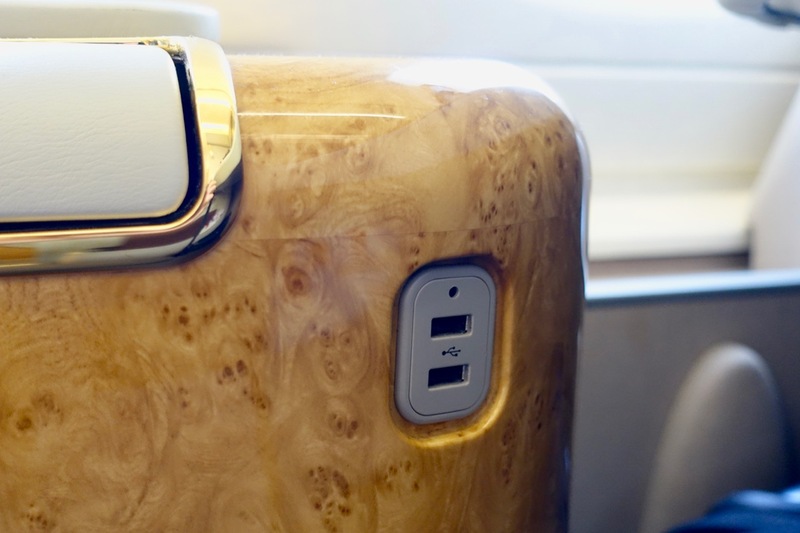 There are two USB chargers and a range of air vents you can tweak to keep yourself cool. 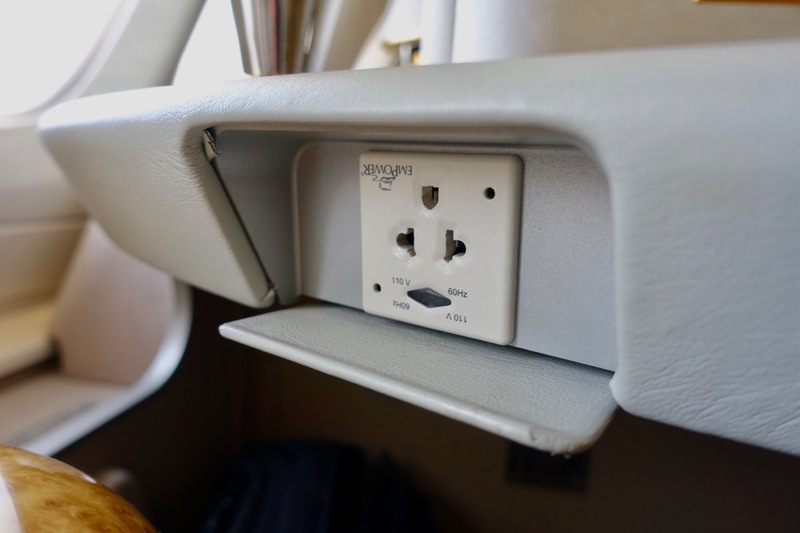 Each seat comes with a full plug you can use to charge your laptop, camera or other devices that USB can’t handle. Then it is full à-la-carte, on-demand dining. Choose any dish, any time you like. 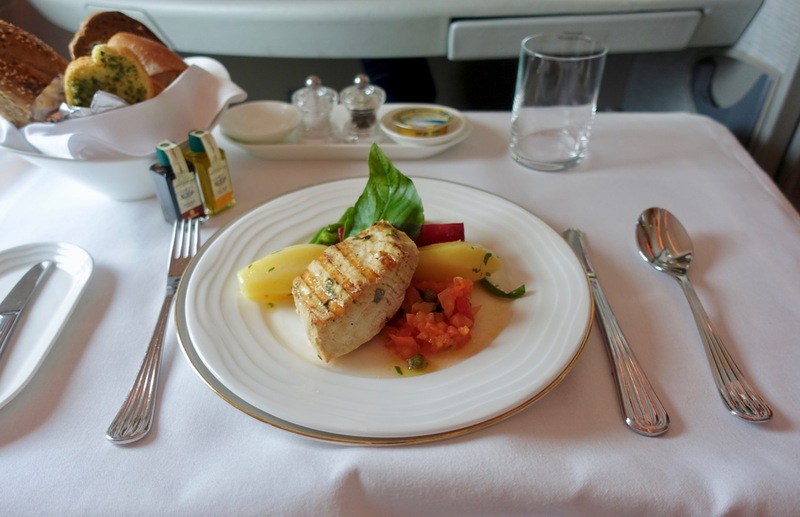 This is actually part of the challenge of travelling in First – you need to think about what you’d like to eat, and when, and plan accordingly. It is otherwise tempting to either eat at the wrong time or order too much or too little. 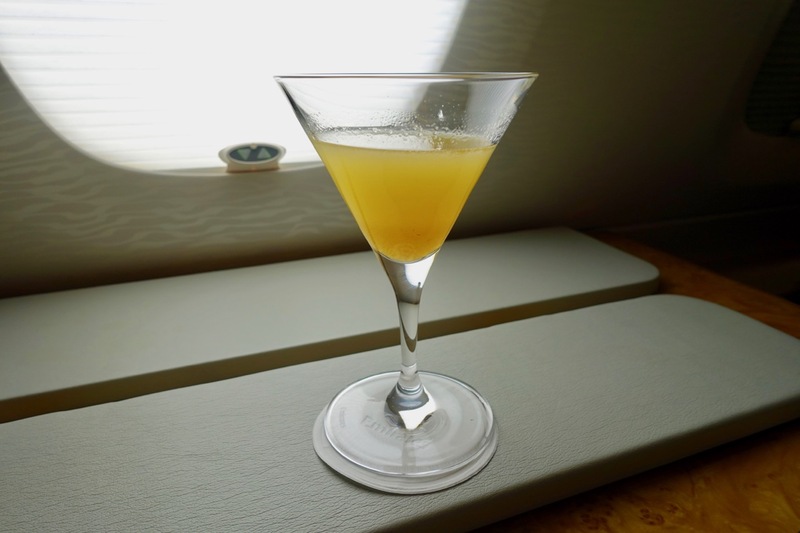 Located at the back end of the upper deck behind the Business Class cabin is the bar, which is a great ‘escape’ – or change, at least – from the privacy and relative isolation of your First Class seat. 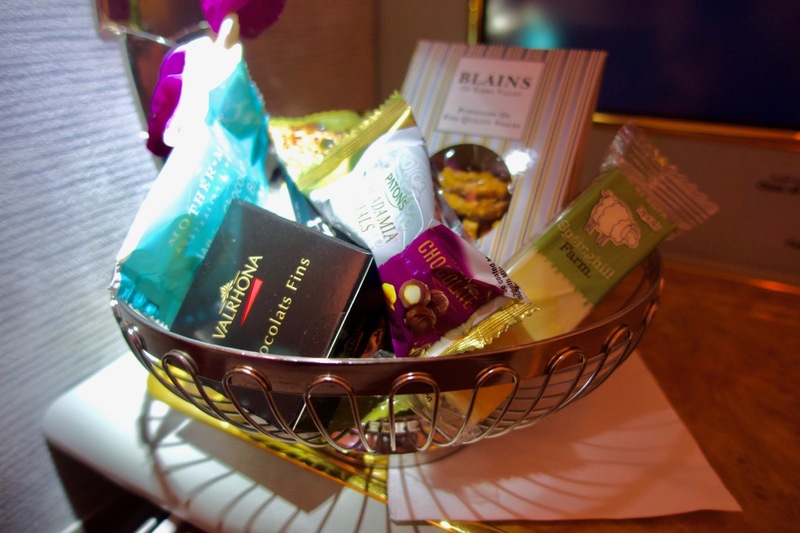 Here you can chat with fellow passengers from Business or First Class and order a drink or collect a couple of canapés. 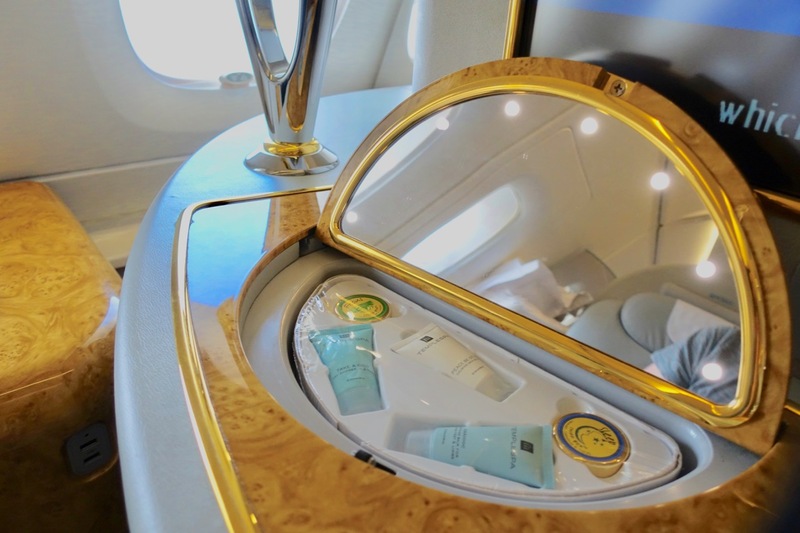 The most unique aspect of the Emirates A380, in my opinion, is the ability to have a shower on-board as a First Class passenger. 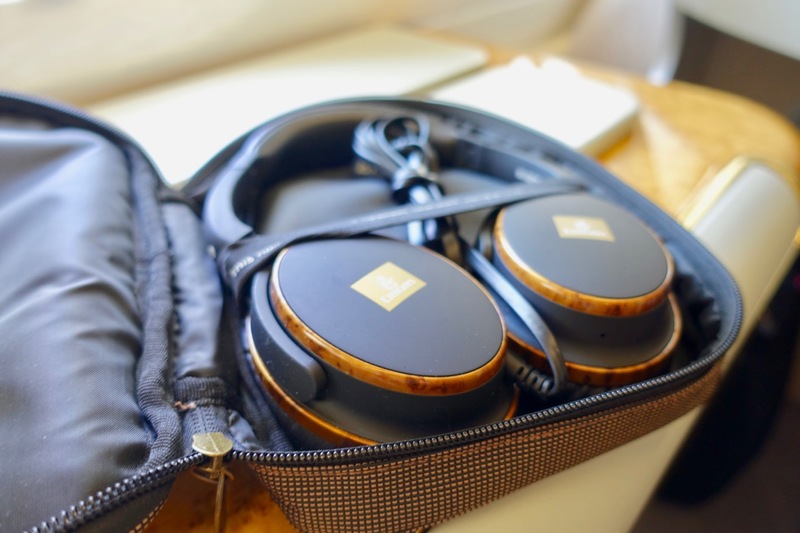 It is an amazing way to refresh yourself mid-flight or upon waking. 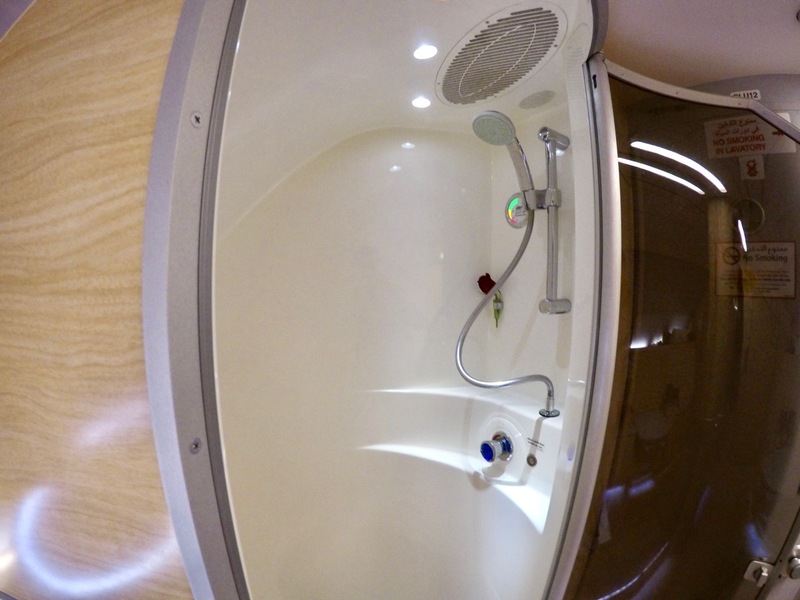 There are two shower suites at front of cabin and it is advisable to make an appointment with the cabin crew if you know when you’d like a shower and the cabin is relatively full. If not, don’t stress and just go when it makes most sense for your journey. If you’re on a one-stop flight to somewhere via Dubai, then that means two showers, one for each flight. I don’t think I’ve ever arrived at a destination so clean, to be honest. By collecting Qantas Points, you get access to redeem them for one of the less ‘available’ redemptions out there. 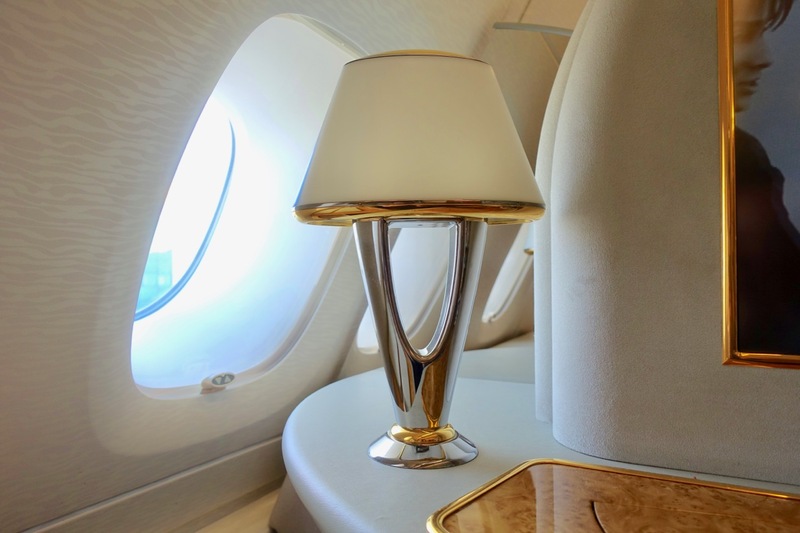 Emirates don’t partner with many frequent flyer programs and are not part of a formal alliance like oneworld, so Qantas Points are one of the key currencies with which you can book Emirates flights. Note that redemptions on Emirates (a ‘preferred’ Qantas partner) are cheaper than on airlines like Qatar Airways, Cathay Pacific and British Airways. 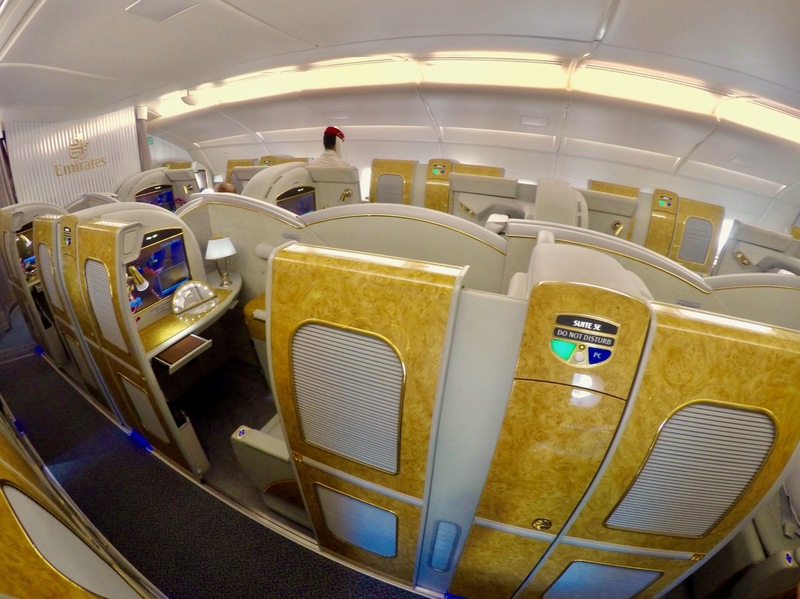 If you are wanting a stopover of 24 hours or more, perhaps in Dubai or a transit city like Singapore, you’ll have to make two separate award redemptions. Qantas calculates distance based on the sum of each individual segment, e.g. 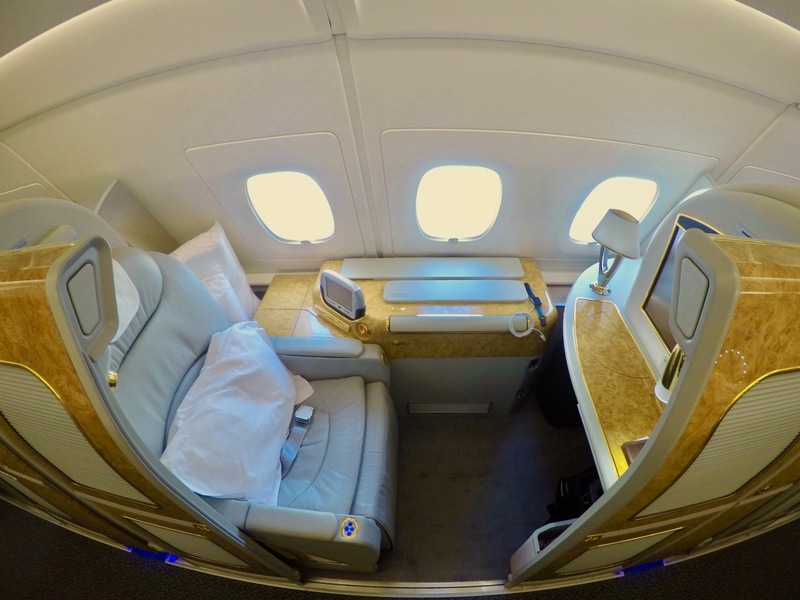 Brisbane – Dubai – Johannesburg, rather than simply origin-to-destination, e.g. Brisbane – Johannesburg. 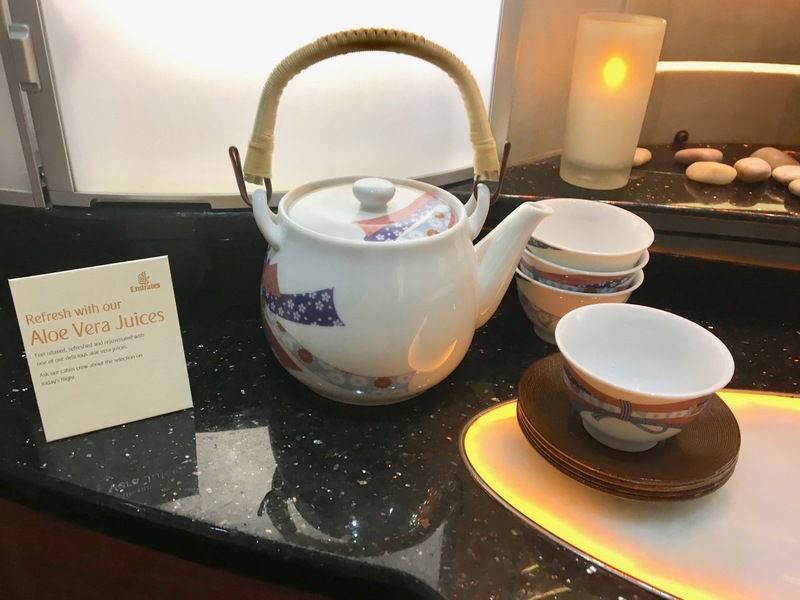 A less-common but good-value way to make an Emirates redemption is by buying Starpoints from Starwood Preferred Guest and transferring them to Japan Airlines Mileage Bank. 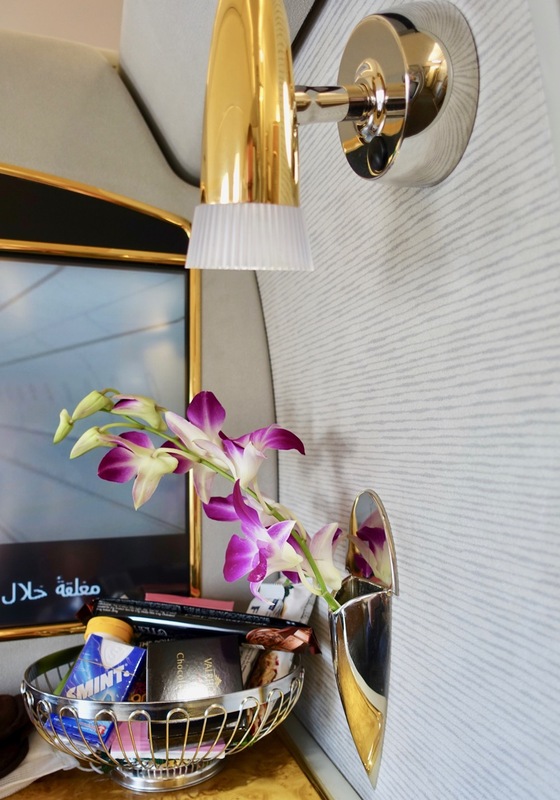 As an Emirates First Class passenger, you’ll get access to any Emirates Lounge in Dubai or around the world. 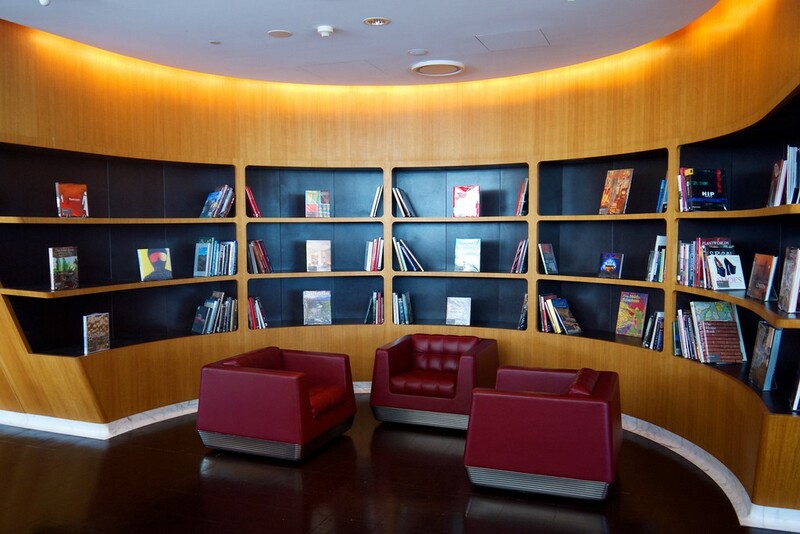 Through their partnership, you can also access the Qantas International First Lounges in Sydney and Melbourne, and the Qantas International Lounge in Brisbane, Singapore and Hong Kong. 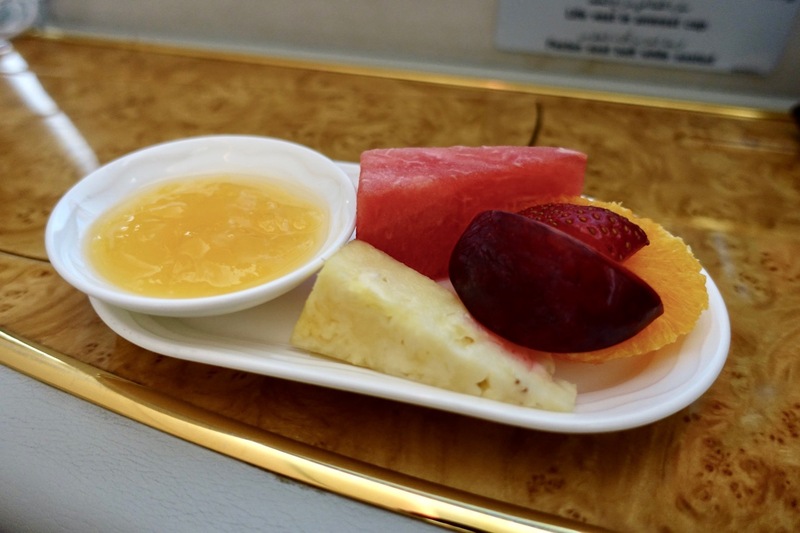 Emirates First Class passengers cannot access the Qantas International First Lounges in Auckland or Los Angeles. 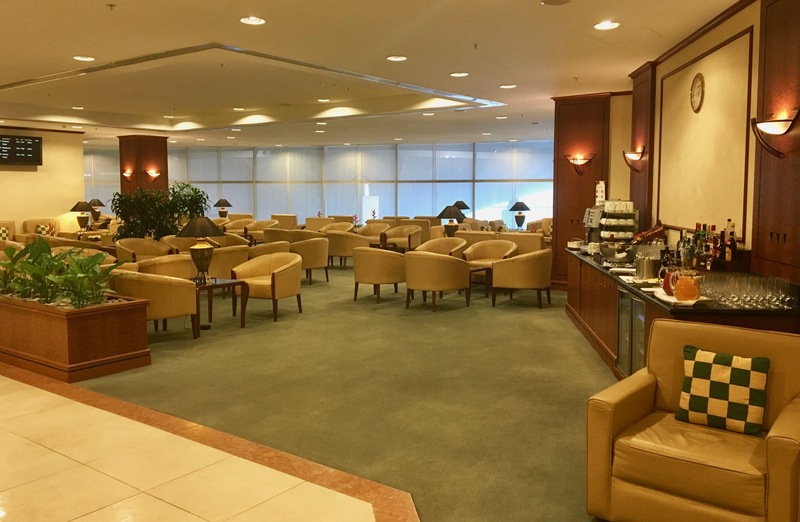 Here is a full list of Emirates, Qantas and other partner lounges. 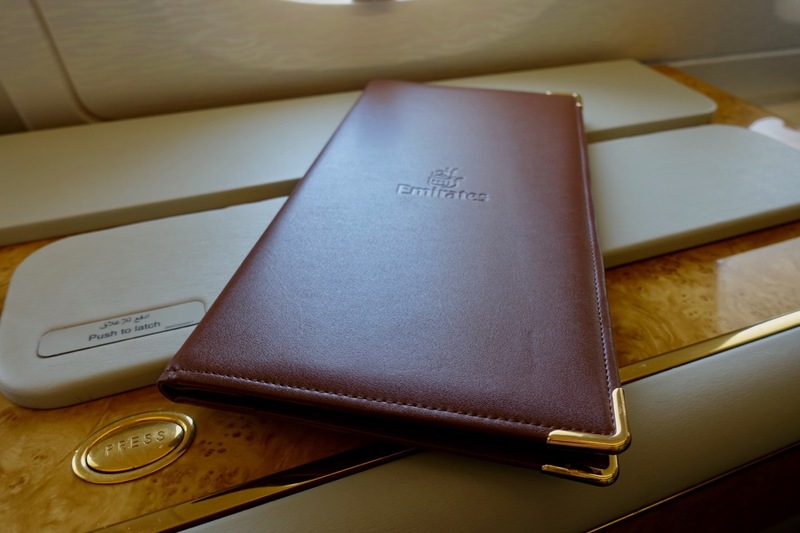 Emirates First Class is ideal for anyone with a growing Qantas Point balance who spies points redemption availability and can justify spending more points on the First Class experience. I’d argue it’s a totally luxurious, but unnecessary way to travel vs Business with everything else about your itinerary being equal. 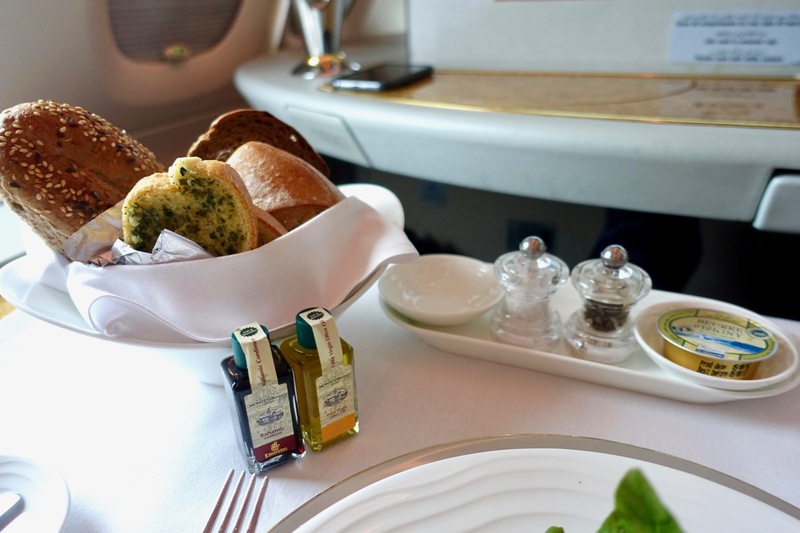 For most people, Emirates Business Class would be a great experience, with thousands of points saved. 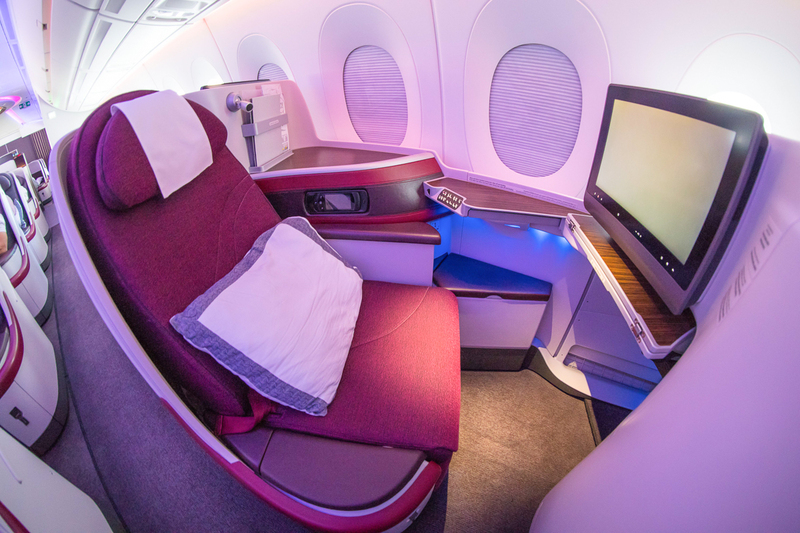 However, sometimes only First Class is available for points redemptions, or if your points balances need using up, then why not? 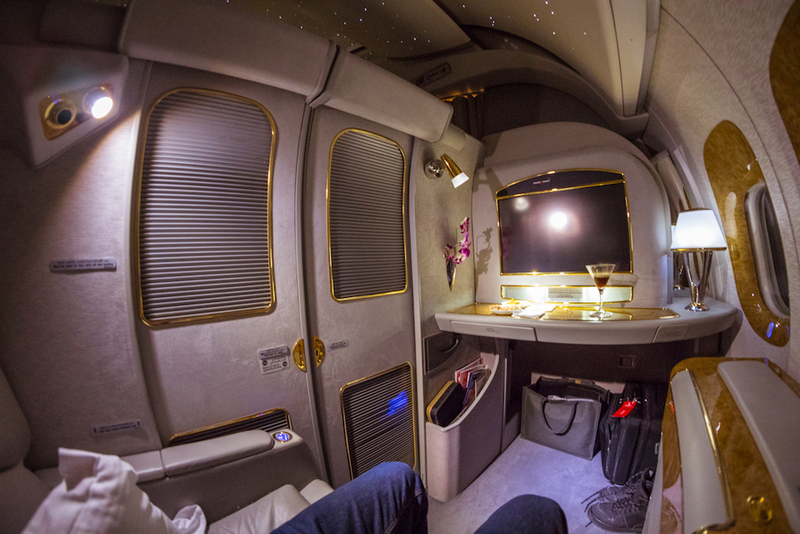 There is nothing I would criticise about Emirates A380 First Class. The cabin is not necessarily to my (and many others’) taste but you can’t argue with the comfort, dining and service on offer, and the fact that we can redeem Qantas Points for Emirates flights – one of the few currencies that make this possible – makes it a key way to use up your Qantas Points balances. When do Emirates release their availability on to qantas.com ? I looked for next June through Dubai and only the Qantas flights were available. 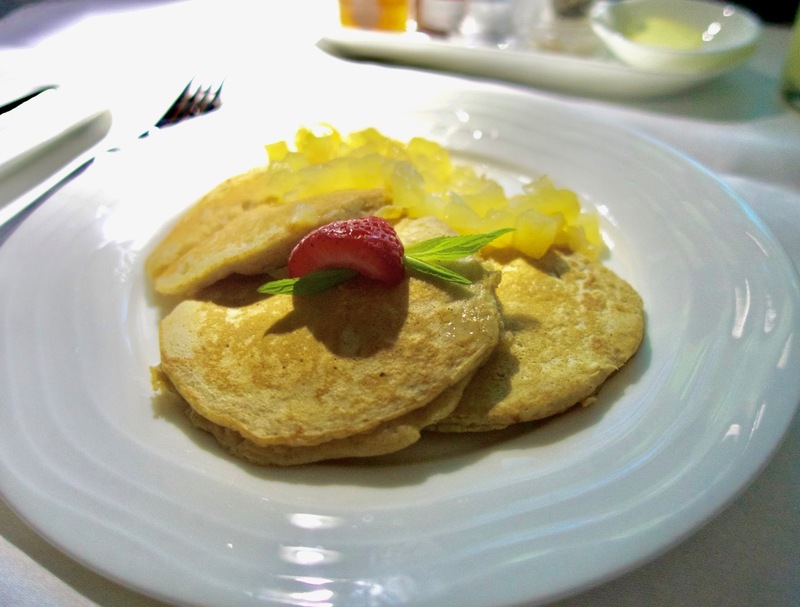 Why do you recommend the Qantas First Lounge in Melbourne over the Emirates First Lounge? 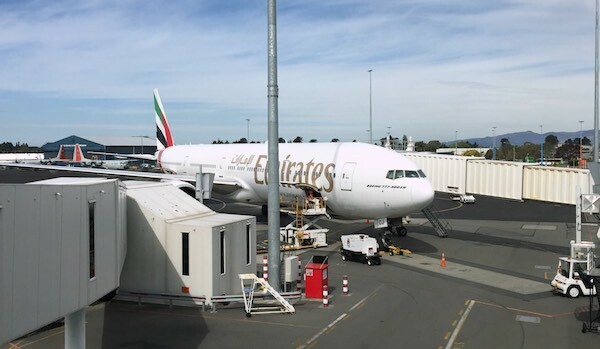 I’m flying Emirates first at the end of the month from Melbourne; why do you recommend the Melbourne Qantas First Lounge over the Emirates First Lounge? 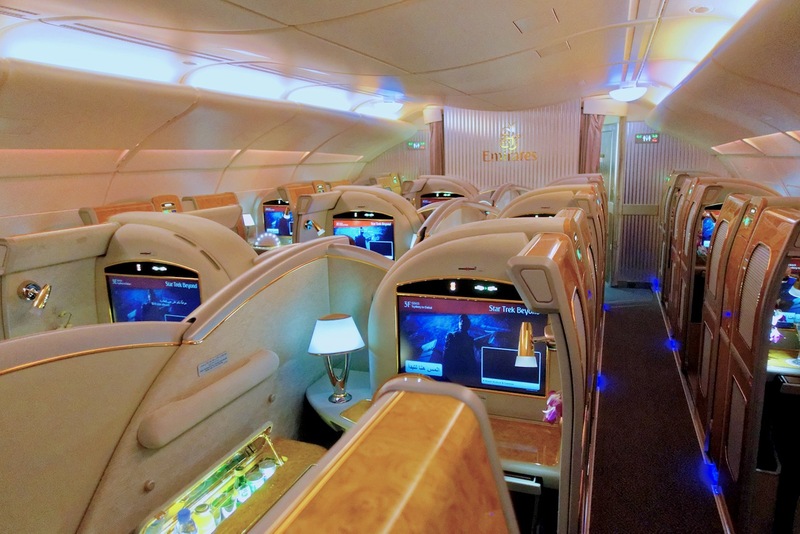 Well I booked Melbourne to Dubai via Singapore on EK405 and then onward from Dubai to Nairobi on EK721 in First Class. Total cost 168k points and $639.58. 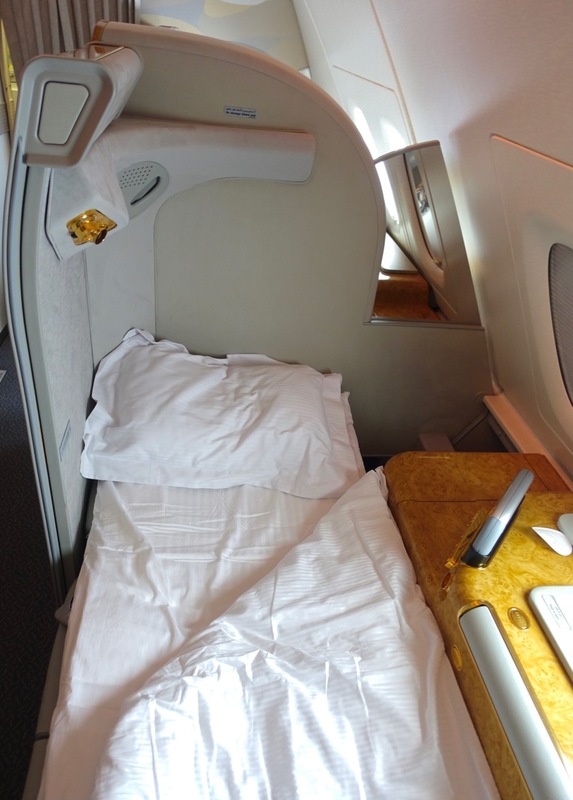 For that I get two flights on the A380 with the shower, a ‘free’ Dubai Connect Hotel for my 10 hour stopover in Dubai, chauffeur to Melbourne airport (and to / from Dubai hotel) and B777 flight to Nairobi. 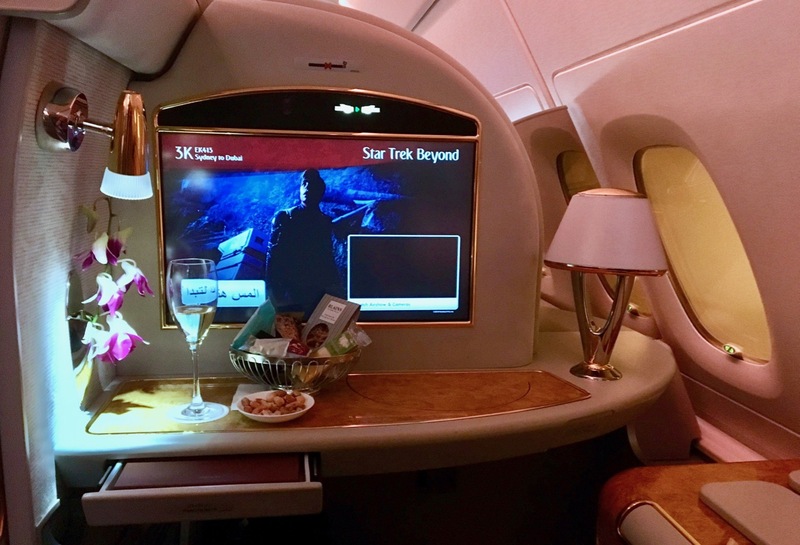 Can’t wait to try out my first 1st class international flight in November and try Emirates First Class out, love this story. 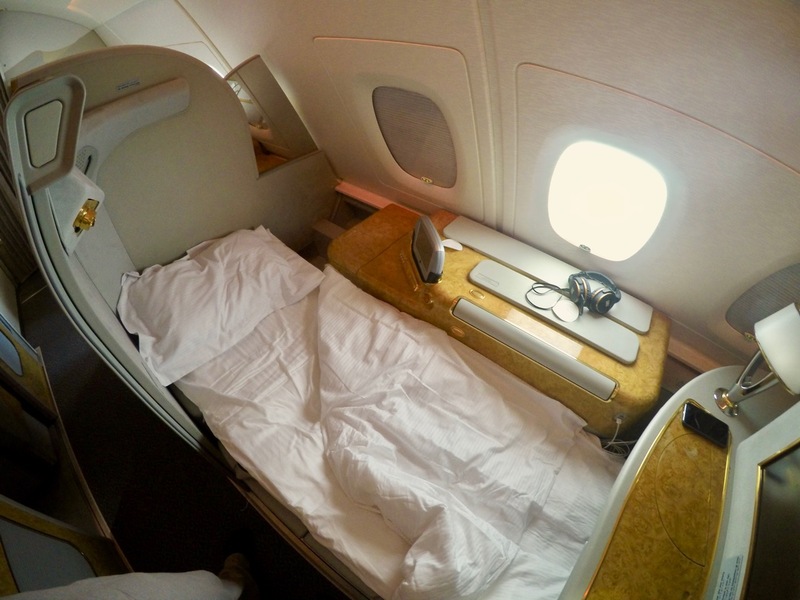 Also recently booked ADL-SYD-DXB-CDG in first (192k points) and the total fees were $677.39pp. And about the same again return. Yes I noticed that as well Simon. I’ve booked MEL-SIN in EK first in a couple of weeks and the fees were $311.00. 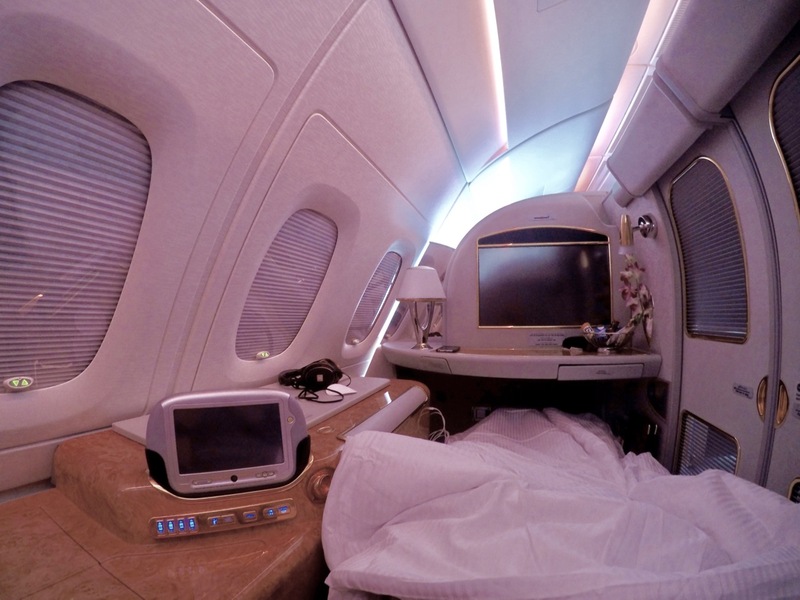 The Emirates First class is a gaudy monstrosity and I loved it.. I challenge anyone who tries the onboard shower for the first time not to giggle and grin at the absurdity of it all. 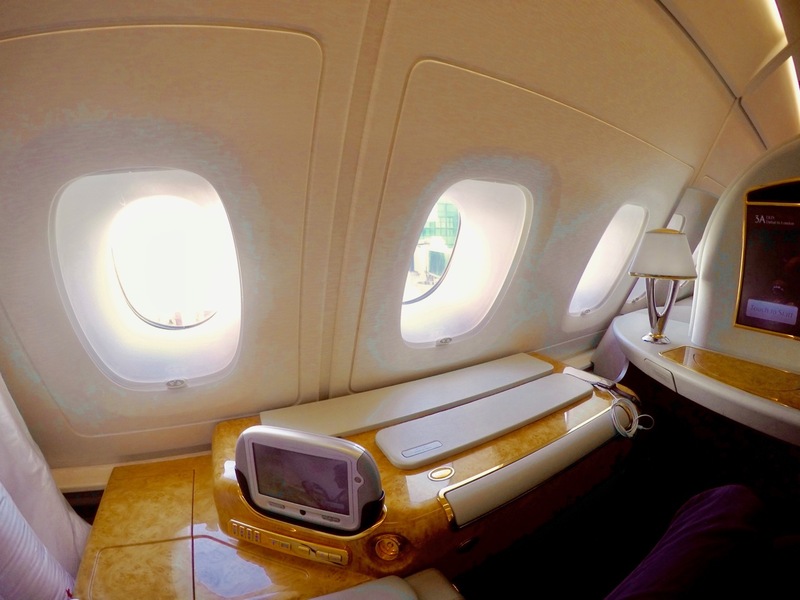 Emirates business is very nice, but your one of 76 others on the A380, and while its nice its not special. 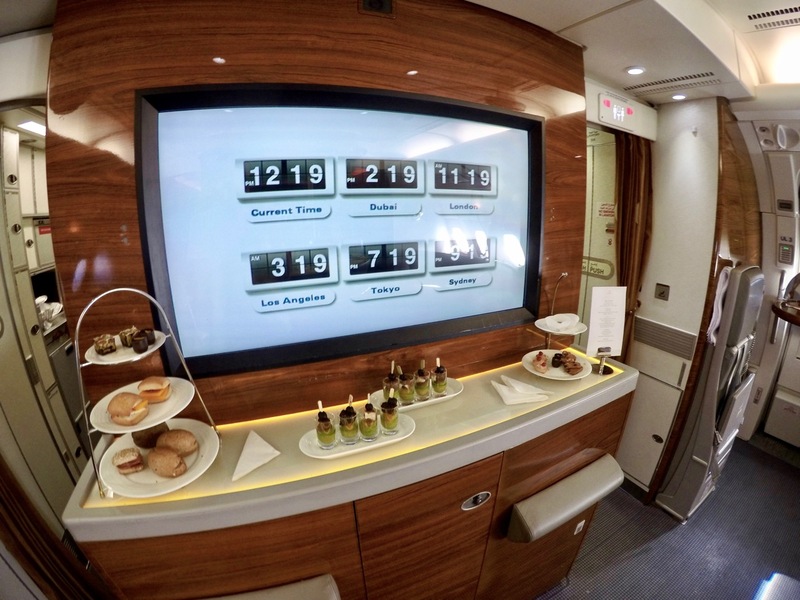 Emirates does J very well, but with numbers they carry it feels a little like a very premium premium economy especially on the 777. 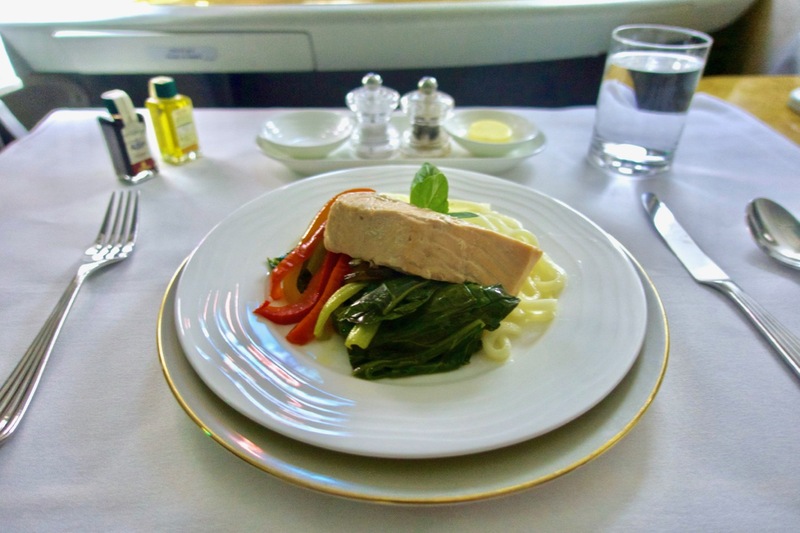 First class is fun, and certainly a real experience. if your saving the points for something special its worth the extra. Michael, whatever benefits there might be about the 777 over the A380, they pale into insignificance when the cabin volume is taken into account. The A380 is soooo much quieter than the 777. And for me, the noise is the single most fatiguing thing when travelling long haul. 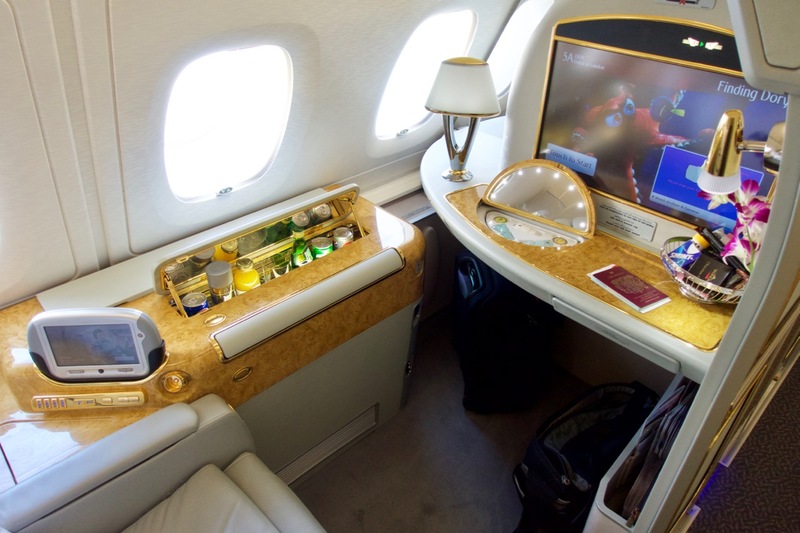 I’ll add a few comments on my recent redemption with EK first class using QFF points. 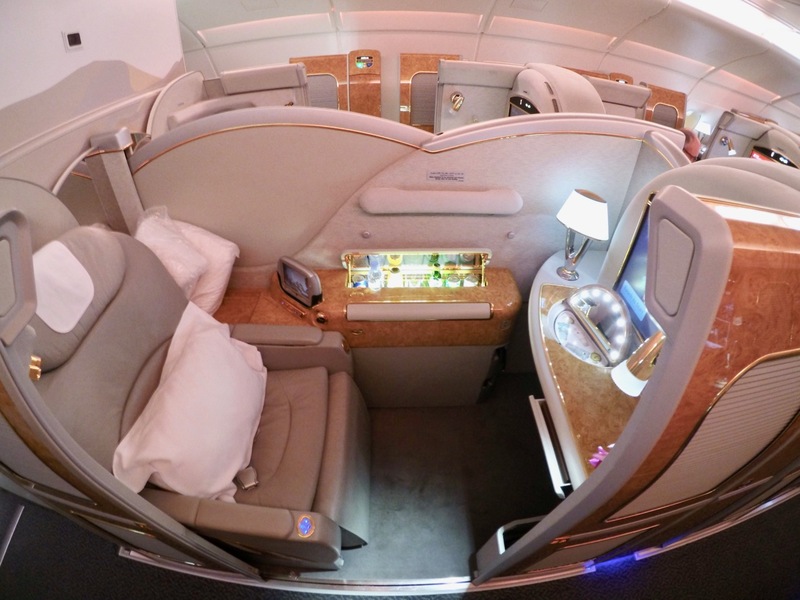 The BNE-DXB A380 is very hard to book. EK tend to release only the 777 to BNE. The way to work around it is to transit in SYD or MEL by tagging a domestic QF J flight in the same award (so no extra points) which is very easy considering QF has one flight every 30min between BNE/SYD/MEL. 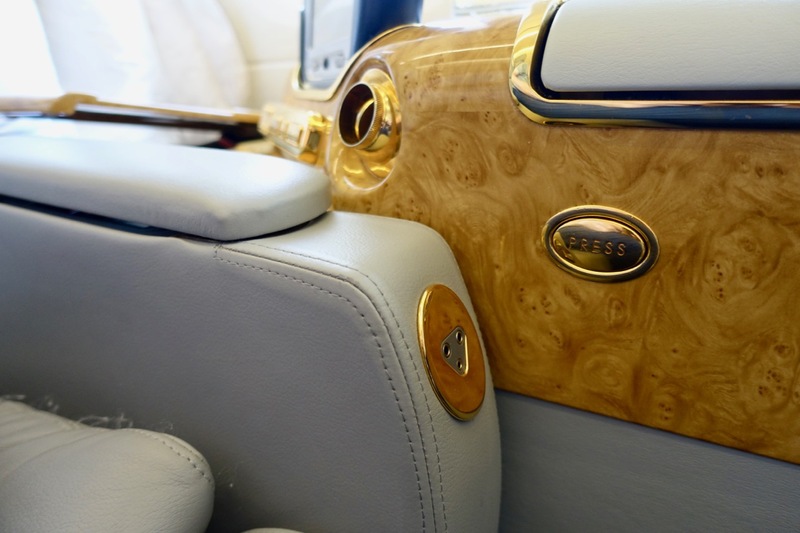 You’ll still get chauffeur for your domestic leg. 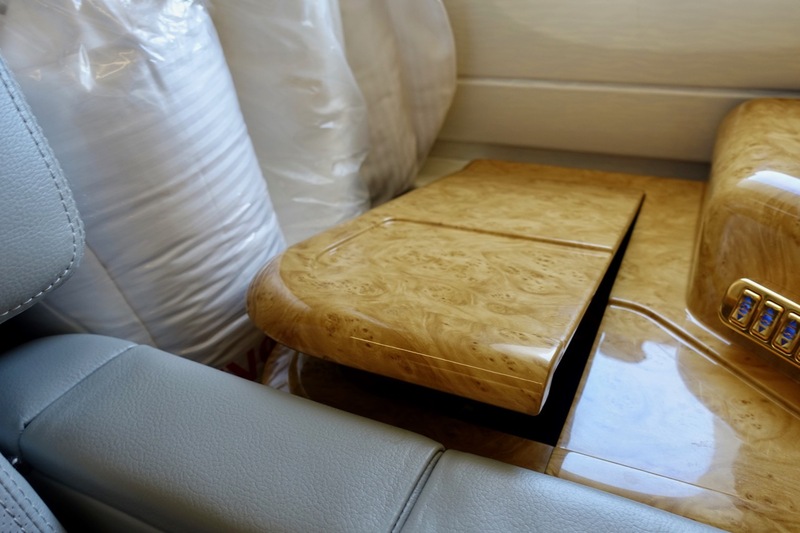 I connected through ADL and I got rt chauffeur between ADL airport to the transit hotel, then chauffeur from BNE airport to my home. First class in 777 maybe superior to A380, not only you get a more personalized service, the seats are actually wider and more headroom. 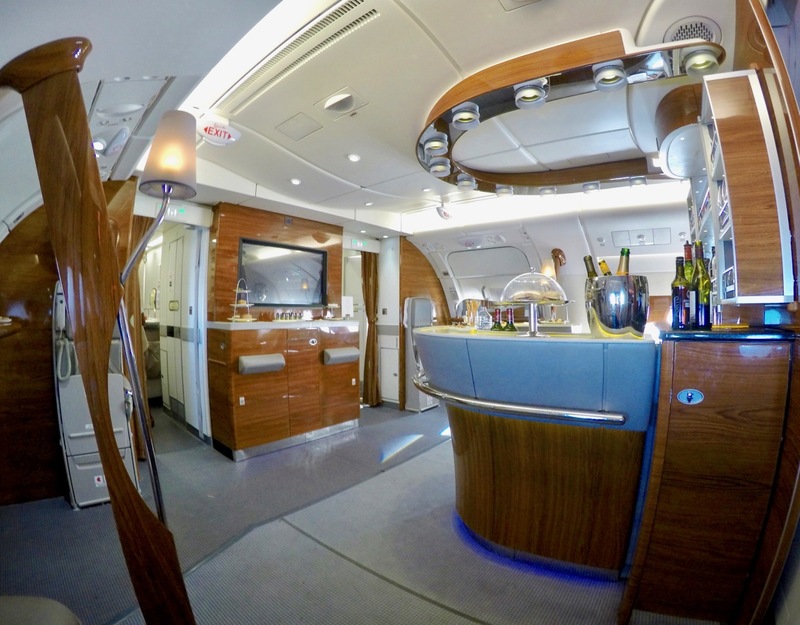 Unless you are desperate for shower onboard (which I agree is a very cool feature and you should do it at least once) and want to socialize in the bar, 777 maybe a better choice. Mini bar isn’t useless. You can take all of the stuff home 😉 EK will even give you a nice bag to carry all the stuff home. Here is where A380 also trumps 777. On A380 they give you a decent carrying bag made of fabric. 777 they just give you a plastic bag.